The Date: Dec 6, 2014. The weather man was calling for perfect conditions for some fishing. We had contacted all of our local regular patrons, and they all seem to have Holiday stuff going on that day. We decided to not waste this perfect weekend day on the water and do a family fishing trip. Early morning for the kids on a Saturday, but they too enjoy fishing. We loaded up the boat and the kids, the dog and our “adopted son” Ty for a day on the water. Heading to an area known as Gunsmoke today! The temperature was a perfect 80 plus degrees today and the water topped in at 72 degrees. The weather man called it right! The water was glass calm and the day was perfect. We get to our first spot and within minutes we are pull in 4 Lane snappers the largest at 18 inches. Then Ty yells out “Oh captain, I’ve got a big one!” Pulls in a 20 inch Hogfish! Oh, yeah the Hogfish are back! 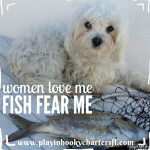 Then we all start pulling in the Hogfish, Porgy, and the Captain is pulling in Scamp (which are all undersized). Finally he pulls in his first Hogfish! He decides to switch bait to a live scaled sardine. The minute the bait hits the bottom the pole bends in half. After a couple long runs he landed the biggest (keeper) catch of the day, a 24 inch Mangrove snapper. Ty drops a live pinfish as the fish finder is marking big fish higher up in the water column. “Monique, take this one!” the captain shouts and hands her the bent pole. Amber Jack, Monique has reeled in an Amber Jack! Tara yells “Fish on!” and pulls in the rarest catch of the day a 14 inch Mutton Snapper. “I’ve never caught a Mutton in my life” Says the captain! Of course it’s under keeper size, but still a terrific catch! The fish were non-stop biting from the minute we dropped the lines in the water to the pulling up of the anchor. We end up limiting out on Hogfish. We have an amazing day of fishing! While fishing we see a four foot sea turtle swim up next to the boat! The water was crystal clear. We could see probably 40 feet down! As we head in from a very successful day of fishing a Dolphin decides to swim at the crest of the boat and race us to shore! What a wonderful day! 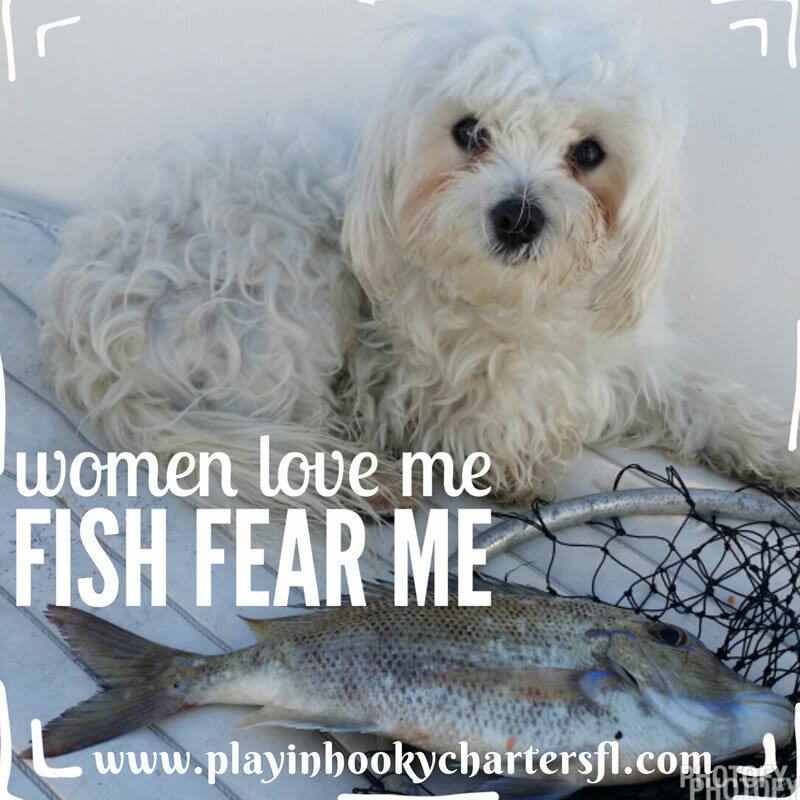 The kids enjoyed being on the water and doing some fishing, and we brought home a freezer full of delicious fish! 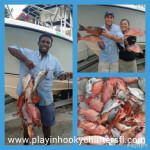 The Loot included Hogfish, Grey snapper, Lane Snapper, Mangrove Snapper, and Porgy. 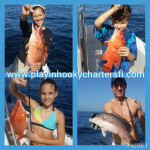 We also caught but could not keep Mutton Snapper, Amber Jack, Remora, Trigger Fish, Scamp grouper, Bonita and Red Grouper. Winter Fishing on the Gulf is truly the best Fishing!